Biological invasions are happening everywhere. As a main part of global environmental change, they have become a leading cause of the worldwide decline in biodiversity (Mack et al 2000). With such far-reaching ecological effects a lot of effort has been put into finding efficient ways to manage these species. Obviously, the best way to deal with invasive species is to prevent them from invading in the first place (Mack et al 2000). This is, however, not always possible. After establishment, most methods of control are expensive, labor intensive and can have unintended costs. Additionally, for marine environments, where invasions can be much more complex, most of the common methods of prevention and control are not feasible (Atalah et al. 2013a). As an alternative to the labor-intensive and terrestrial-centric methods, biocontrol has become a popular option. The release of a biological agent, which could be anything from a pathogen to a plant, can be an easier alternative to methods like manual removals or continuous trappings. Howeverthere are many downsides to biocontrol and non-target effects are often associated with these introductions (Thomas & Willis 1998). There is always a danger when introducing a species that they will in turn become a pestand doubly so if it is an exotic species, as is often the case in classic biocontrol (Louda et al. 2003; King & Moody 1982). 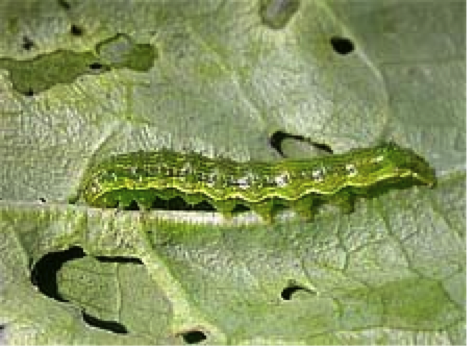 Avoiding these non-target effects has therefore become a focus for biocontrol efforts. A leading option for this is augmentative biocontrol. Itconsists of bolstering a population that already exists so it can naturally fight off the invaders (Van Lenteren 2012). This would mean significantly decreasing the risk of non-target effects while getting the same amount of control as classical biocontrol. Sounds perfect, right? Like the panacea for the negative sides of biocontrol? …Well that’s not quite the case. A large-scale literature review done by Collier & Van Steenwyk (2004) showed that almost half the time augmentative biocontrol was studied it failed to meet the desired outcome. These failures were based on a multitude of variables including predation, badly chosen environments, and cannibalism within the released species. Additionally, there were times that native populations will almost always be outcompeted just due to ecological circumstances. Of course this is not to say that augmentative biocontrol is never effective. There are cases where this process can be ecologically and economically the right choice (Atalah & Forrest 2013; van Lenteren 2000; van Lenteren 2012). It has been pointed out that the Collier & Van Steenwyk (2004) review was heavily based on examples in the USA, rather than giving a full view of augmentation applications (van Lenteren 2006). This means that the 50% failure rate is skewed towards a country where augmentative biocontrol is seldom the right choice. In other parts of the world the success rate may be much higher. Additionally the Collier & van Steenwyk (2004) study is in some part based on poorly selected applications. Usage of augmentative biocontrol on pests which aren’t appropriate for this type of control would skew the results as well. If the review was based on only properly selected applications the success or failure rates may have been extremely different. Below are two such situations where the application of augmentative biocontrol has been demonstrated to have the capacity to control pest species while decreasing non-target effects. Biocontrol has been used heavily for agricultural pests due to its reputation as a safer alternative to chemical herbicides and pesticides (van Lenteren et al. 2003). With agricultural profits being based on the health of the crop species, it seems obvious that non-target effects could have large costs associated with them. Therefore it is necessary to find a way to control pest species without endangering the crop and the insect species needed for successful harvests. Augmentative biocontrol has been applied to both insect and plant pest species in the agricultural world. Squirting cucumber, a common agricultural plant pest in the Mediterranean Basin, was the focus of one of these studies. The insect Aspongopus viduatus F. was used in an inundative release to define its ability to control the pests. The tests were successful in showing that squirting cucumber was the preferred host of these insects and would therefore be very unlikely to affect similar species used as crops. The prospects for mass rearing and further releases are therefore very good and will be used on a larger scale (Ben-Yakir et al 1996). In North and South America, and several parts of Asia, Trichogramma spp, are currently being used successfully as control for Lepidopteran pest species, which damage everything from cereal crops to forests (Van Lenteren & Bueno 2003). These parasitic insects work as control by infecting the eggs of the Lepidopteran species through an inundative releases (Smith 1996). In Latin America specifically, this type of augmentative control is used widely as a cost effective control method used to avoid pesticides (Van Lenteren & Bueno 2003). Augmentative biocontrol has not been heavily researched in marine environments but it shows a great deal of promise. Invasive seaweeds, kelps and algae have invaded coastal regions around the world and consistently efficient methods of eradication and control have not been found (Anderson 2007). One of the main worldwide invaders is the Asian kelp Undaria pinnatifida. It has been found out of its native range in North and South America, Europe, Australia, and New Zealand (Atalah et al. 2013a; Casas et al. 2008; Thornber et al. 2004). Control of this species is a large concern and the focus of worldwide research. In one of those studies, augmentative biocontrol has been used in conjunction with other methods as a control of Undaria in New Zealand. 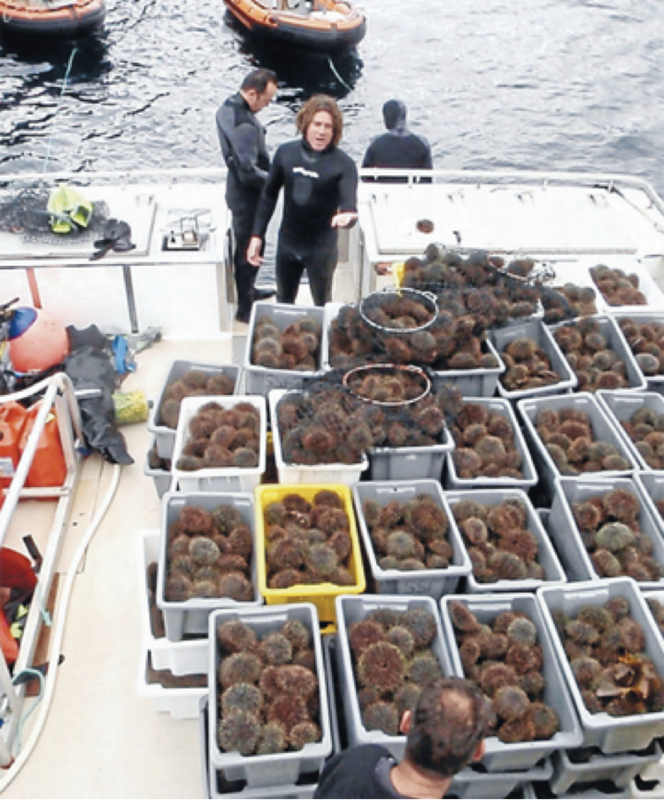 A large group of sea urchins, Evechinus chloroticus, were transplanted into Breaksea Sound, Fiordland on the South Island. These sea urchins have been found to successfully control Undaria with little to no non-target effects (Atalah et al. 2013a). Similar types of augmentative biocontrol have also been applied to biofouling of marine structures. Biofouling communities, often found in ports and similarly developed areas, can be composed of many translocated exotic species brought by marine vessels. In these cases natural grazer populations can often not be sustained due to other environmental factors. Due to this fact, augmentative biocontrol has been focused on competitors to exotic pest species (Atalah et al. 2013b). Again New Zealand is leading the way for research into the areas. On the South Island of New Zealand, the population of the sea anemone Anthothoe albocincta was increased through translocations in the Marlborough Sounds. The presence of these sea anemones was found to decrease the amount of problematic pest fouling species (Atalah et al. 2013b). It seems likely that similar augmentative methods, with only a small bit of alteration, could be applied to other marine pests. So where does augmentative biocontrol stand now? Even with its limitations, augmentative biocontrol has been successful in the cases discussed above. Additionally it shows promise in other ecosystems like the Australian arid zone where dingoes are being studied as a possible form of feral cat control (Fleming et al. 2012). The methods are, however, applied in a frustratingly small percentage of the world (van Lenteren 2012). This could be due a variety of reasons including a lack of research and perhaps just the fact that many managers are unaware of the idea itself. Or maybe the name “augmentative biocontrol” itself just scared people off the idea. It sounds so overly complicated without really giving you an idea of what it is. Something simpler like augbio or even just augmentation could change things. As for the limitations found through past research, they are ones that can, in many cases, be controlled for with careful research and site selection. Just like any other form of pest control, You have to identify what species are the best candidates to be controlled. You have to pay careful attention to whether what you’re doing is actually the right thing for what you are trying to control. Though the uses of augmentative biocontrol are not all encompassing, there is no reason wider applications should not be conducted. There are specific instances where augmentative biocontrol can be extremely effective and these instances are found on a global scale. Success could be seen anywhere that native populations could control an invader at higher numbers or in marine environments where most other control methods for invasive species are not possible. With proper research and well-designed releases augmentative biocontrol could decrease non-target effects of invasive species management worldwide. The success or failure of augmentative biocontrol is entirely up to those people implementing it. Casas GN, Piriz ML, & Parodi EL (2008) Population features of the invasive kelp Undaria pinnatifida (Phaeophyceae:Laminariales) in Nuevo Gulf (Patagonia, Argentina). J Mar Biol Assoc UK. 88(1):21–28. Collier, T., & Van Steenwyk, R. (2004). A critical evaluation of augmentative biological control. Biological Control, 31(2), 245-256. Fleming, P. J., Allen, B. L., & Ballard, G. A. (2012). Seven considerations about dingoes as biodiversity engineers: the socioecological niches of dogs in Australia. Australian Mammalogy, 34(1), 119-131. King, C. M., & Moody, J. E. (1982). The biology of the stoat (Mustela erminea) in the National Parks of New Zealand I. General introduction. New Zealand journal of zoology, 9(1), 49-55. Mack, R. N., Simberloff, D., Mark Lonsdale, W., Evans, H., Clout, M., & Bazzaz, F. A. (2000). Biotic invasions: causes, epidemiology, global consequences, and control. Ecological applications, 10(3), 689-710. Nicot, P. C. (Ed.). (2011). Classical and augmentative biological control against diseases and pests: critical status analysis and review of factors influencing their success. IOBC/WPRS. Phillips, B. L., Brown, G. P., & Shine, R. (2003). Assessing the potential impact of cane toads on Australian snakes. Conservation Biology, 17(6), 1738-1747. Thomas, M. B., & Willis, A. J. (1998). Biocontrol—risky but necessary?.Trends in ecology & evolution, 13(8), 325-329. Van Lenteren, J.C. (2000). Measures of success in biological control of arthropods by augmentation of natural enemies. In: G. Gurr and S. Wratten (eds), Measures of Success in Biological Control. Kluwer Academic Publishers, Dordrecht. pp. 77–103. Van Lenteren, J. C. (2012). The state of commercial augmentative biological control: plenty of natural enemies, but a frustrating lack of uptake. BioControl,57(1), 1-20. Van Lenteren, J. C., & Bueno, V. H. (2003). Augmentative biological control of arthropods in Latin America. BioControl, 48(2), 123-139. Great post! Thanks for using our research as an example. However, I just wanted to clarify a statement around the non-target effects. Your post mentioned that urchins had ‘little to no non-target effects’. However, these non-target effects were pronounced, but they were considered to be localised and reversible, and arguably outweigh the irreversible and more profound ecological impacts associated with the establishment of an invasive species in a region of high conservation value.